It is most popular in South Africa. Topics: Content, Travel Awards, The Aa, Competitions, & Petition. 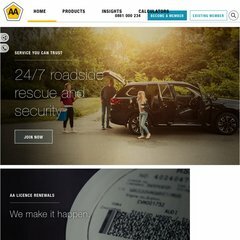 aa.co.za What Puts your Car on the Hijackers’ Wanted List? January 2012 .. The estimated 2,761 daily visitors, each view 3.10 pages on average. It is hosted by The Internet Solution (pty) Ltd (Gauteng, Johannesburg,) using Apache/2 web server. There are 2 Nameservers, ns2.iafrica.com, & ns1.iafrica.com. Its local IP address is 196.26.196.114. Website load time is 3888 milliseconds, slower than 93% of other measured websites.